I meant to make a post for St. Patrick’s Day on March 17, but again, life got in the way of blogging and I lost track of time before you knew it. Even the photo on the left was haphazardly shot just before we ate. Although we are not Irish, my Filipino mother raised us celebrating St. Patrick’s Day. No we don’t get all decked out in green clovers or nothing like that, we just partake in this traditional Irish fare of boiled corned beef. Now here is another dish that just about every culture in the world, it seems, has a version of. It is a classic boiled dish with meat and vegetables. So to continue the tradition, I started cooking this on St. Paddy’s day for my girls too. Plus, during this time of year, the grocery stores put this cut of meat on sale. That is always a good thing, I say. It’s also a perfect time to pull our the slow cooker and let it simmer all day, and dinner is ready by the time I come home from work. Although most cooks let the meat potatoes and vegetables simmer all day, I always wait to cook the vegetables just before we get ready to eat. My girls just won’t have any overcooked veggies. So when I got home from work, I took the meat out of the broth to slice, and put the broth back on to boil. To this I added the potatoes and when they were almost tender, added the green beans and then the cabbage. Traditionally, root vegetables such as carrots and turnips are also added but I didn’t have any turnip roots and my girls won’t eat cooked carrots. So for added texture, I added some green beans instead. we had this too. love love this dish :), i make it at least 3 times a month..hehe. I see Irish corned beef in my local here and wasn’t sure what to do with it. Thanks for the idea Jmom, i’ll be making this real soon (looks masarap kasi). Hi theoretical, sorry I forgot which brand I used for this recipe. I usually just buy what is on sale at the market. Now I wish I had noted the brand on this one, cause I liked that fact that it wasn’t as salty as usual. What a great idea of making sinigang na corned beef! I’ll have to try that sometimes. I don’t know why it wouldn’t work, this is very close to our nilaga. Hi Thess! I’m curious, how do they prepare corned beef there in Holland? pareho din ba? Have a great weekend too! Hi Jmom! may you have a fine weekend! Great idea to cook the vegs just before you eat. I always try to time it so that I’ll add them to the slowcooker when we are ready to eat in an hour or so, but it never fails to have something come up and the vegs are overdone by the time we actually sit down to eat. Ah yes…and rice is also a must when eating this dish! Hi JMom. What corned beef do you use? 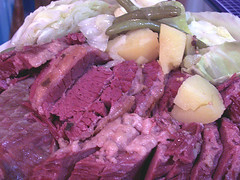 And if the corned beef you use is not availabel locally, what substitutes would you suggest? Sentro, the Greenbelt resto, has a ‘sinigang’ na corned beef. Seeing your post reminded me of their sinigang na corned beef. I can imagine what your boile corned beef tastes like…. Sha, yep, talagang Irish…. I even accompanied it with patis and lemon, to the horror of my salt intake police. hahaha!